The vessel is the first mega class cruise liner in a series of two for Royal Caribbean International planned at the Finnish Kvaerner Masa Yard. The yard in Helsinki built Royal Caribbean's first four ships, the Song of Norway (26 years ago), Nordic Prince and Sun Viking, which were delivered in the early 1970's. The song of America was completed in 1982. Also, the yard lengthned both Song of Norway and Nordic Prince. The yard also developed the conceps for RCCL 3rd generation (Sovereign, Monarch, Majesty of the Seas) and 4th generation (Legend, Splendour, Rhapsody, and Vision of the Seas) vessels. 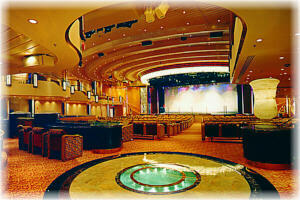 High quality interior materials have been used in the ship design, and the interior design is sophisticated. Large green glass walls and windows cover large areas of the ship. She incorporates more glass than any other cruise ship afloat. More than two acres of windows, suspended glass window walls, glass canopies, skylights and glass windbreaks open the ship to panoramic vistas around every turn. Virtually every public room has an expansive view of wide open seascapes or beautiful ports of call. These window walls provide spectacular views from the seven deck high "Centrum" atrium and "The great Gatsby" main restaurant. Also the Sun Deck is surrounded by glass walls, so are the windows of the "Crown Lounge", a trademark of the RCCL fleet. It provides 360 degree views, with one two-deck wall made entirely of glass overlooking the pool deck. For the first time on a Royal Caribbean ship, the lounge is separated from the ship's funnel. Observation and piano lounge by day, it offers spectacular views of ports of calls. At night, the room, which seats 320 guests, is transformed into a dance club. The "Viking Crown" can be reached using the two glass elevators of "Centrum". 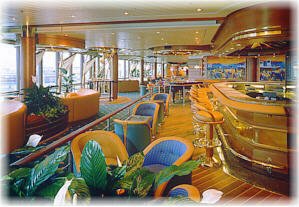 It is on deck four to the "Centrum" where also the "Champagne Terrace" and "Champagne Bar" is found. Further aft, is the lower level of the two deck high "The Great Gatsby" main restaurant that seats 1,140 guests and is equipped with a stage for an orchestra and a two deck high waterfall. On the fifth deck is the outside Promenade deck, the upper level of the main restaurant, the "Casino Royale" casino and in the forward part, the two deck high "Palladium Theater" show lounge, seating 835 guests. On deck six are the secondary "South Pacific" lounge and night club, seating 470 guests, the "Singing in the Rain" midship lounge and separate conference area, the "Schooner Bar, Boutiques of Centrum" shopping area and the upper level of the "Palladium Theater". 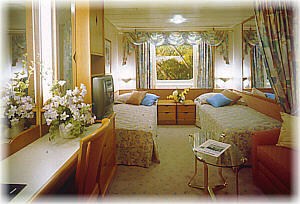 The passengers' accommodation is found on the seventh and the eighth decks as well as on decks two,three and four. 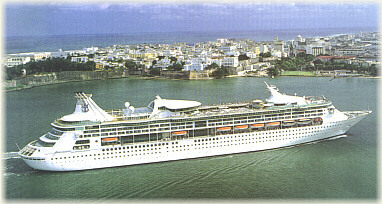 There are altogether 975 passenger cabins of which 22% are suites with verandas and 59% (576) are facing the sea. The largest suites include, in addition to the Royal Suite of 96 m2, five 46 m2 and twelve 34 m2 suites and seventy 22 m2 de luxe suites (all these with verandas). Virtually all 576 outside guest staterooms have picture windows rather than portholes and 212 staterooms have balconies accessed by sliding glass doors. Stateroom balconies' railings are made of glass rather than steel so that guests sitting inside their staterooms can enjoy the passing scenery. All passenger and crew cabins are prefabricated modules. Decks seven and eight also includes she ship's library, card rooms and the "Explorers' Court" and "Crown & Anchor Study". The wheelhouse is on the eighth deck and the officers' cabins on the deck below. Deck nine is the ship's Sun Deck with swimming pools and whirl pools. Aft is the two deck high "Shipshape Center" which includes rooms for aerobics, a gymnasium, sauna and massage areas and a beauty parlour. It is a solarium and a swimming pool area in Roman style including a bar with buffet service. 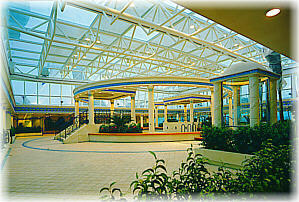 When needed, the "Sun Pavillon" can be completely covered with a two part glass roof, called the "Crystal Canopy". Forward of the "Sun Pavillon" is the "Main Pool Area" with a large swimming pool and four jacuzzis. In further forward are two outside cafeterias and the large inside two level "Windjammer Cafe'" seating 435 guests, where also buffet type breakfast and lunch is served. The partly open "Sun Walk" (deck eleven) surrounds the deck below, and is equipped with a jogging track. Aft is the upper level of the "Shipshape Center" and forward the "Teens Center" and the "Teen Club" discotheque, the "Video Arcade" video game room, the "Kids Center" and the "Children's Playroom" forward of which is the outside "Star Gazing Deck". They include the large Main Galley and the Upper Galley above, a hospital, and a large laundry. The officers and the crew have own messes and dayrooms, a gymnasium and a swimming pool and galley and laundry facilities. Renowned international artists were commissioned to create original works of art to be displayed throughout the vessel. The result is a multi million dollar collection of nearly 2,000 pieces of art transforming the ship into a floating museum. The largest piece on Grandeur of the Seas is a creation by Norwegian artist Knut Steen. Named "Aeolus", it is the focal point of the ship's Centrum. Another special feature of the Centrum is the "Fountain of the Sirens", located on the bottom deck of the atrium. Grandeur of the Seas has a lenght of almost 280 metres, a gross tonnage of 74,140, a 22 knot cruising speed and carries 2,440 passengers which are served by a crew of 760. The power plant machinery is diesel electric AC-AC with electric propulsion motors. The total onboard power developed is 50,400 kW (68,500 hp). The layout of the ship areas have been designed by the yard and Royal Caribbean together with several highly reputed architects in the marine field such as the Norwegian Njal R. Eide, Yran & Storbraaten and Per Hoydahl, Howard Snoweiss from USA, Robert Tillberg from Sweden and SMC Design and Stephenjohn Design. from the UK.